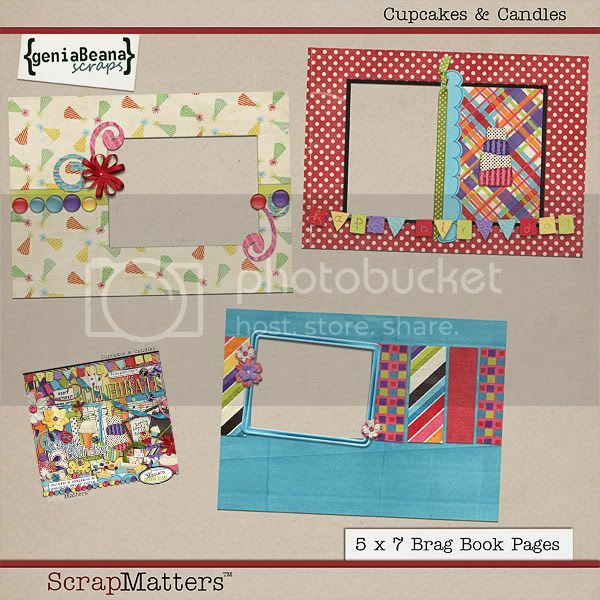 geniaBeana Scraps: ScrapMatters Birthday Blog Train! Toot Toot! It's ScrapMatter's 3rd Birthday Celebration! The SM Design team has created this AWESOME Birthday Collab. You can get it free with any $20 purchase in the shop. The CT and Designers have used this fantastic birthday kit to create a TON of sweet freebies for the blog train. I have a set of 3 5x7 Brag Book Pages that are perfect for showing off those cute birthday photos. if you hit a bump and need to find you way back just head to the ScrapMatters Blog. Don't forget to check in the forums for lots of fun and games all weekend long! Thank you for the gift, but the image is not linked. It takes me to Photobucket. I am doing the happy dance, brag book pages are my favorite!! Thank you! Thank you for the wonderful brag book pages!! Thank you so much for this post. I want to let you know that I posted a link to your blog in CBH Digital Scrapbooking Freebies, under the Page 5 post on Aug. 08, 2010. Thanks again. I love trains, such a fun way to get a great kit, thanks for your part, love it. Great brag book pages! Thank you! Sneak Peeks, CU Sale, and a FREEBIE, too! I'm a Guest at ScrapMatters this Month! It's time for August Color Play at ES!